Sometimes, I can't believe it's been a decade since I turned in my final draft of my first book, Exploring Space:1999: An Episode Guide and Complete History of the Mid-1970s Science Fiction Television Series. The book was actually published by McFarland in April of 1997 (almost nine years ago), and since then has been reprinted in both hardback and in soft cover. It even earned some nice reviews! Which is crazy, because when I wrote the book, I figured that the "history" of Space:1999 was just about over. The laserdiscs had bombed on the market, the Sci-Fi Channel was about to stop rerunning the show - permanently, and new ventures like Babylon 5 and SeaQuest DSV were garnering significant popularity. I figured 'what chance does a 20 year old show from the 1970s have of achieving an objective re-consideration today?" I wrote my book because I wanted to answer some of the absurd criticisms thrown at the series over the year, and least have it on the record - somewhere - because so many accusations were not true. Most of them, in fact, were false...and absurd. But it's funny how fate works. 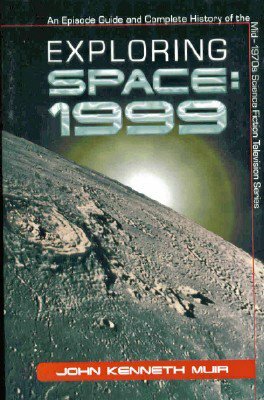 In 1997, the very year my book was released, Columbia House released several episodes of Space:1999 on VHS. Then there were two huge series conventions in 1999 and 2000. And also by 2000, DVD was here to stay, and the entire series was re-released in that format to extraordinary sales and resurgent popularity. As I write this today, there are new Space:1999 novels (from Powys Media), new models of the famous Eagle spaceship (from Product Enterprises) and even new action figures based on the series (from Classic Toys). The year 1999 did not herald the end of Space:1999 fandom as I had naively feared, but - to the contrary - seemed to indicate the arrival of a next phase with a brief "reunion" movie called "Message from Moonbase Alpha," starring Zienia Merton and written by series scribe, Johnny Byrne. Exploring Space:1999 is my first child, the first book I ever wrote, so I do love it like a first-born, though I can see how my writing has developed and improved over time. Today, if I had the chance, I would probably take a different tack writing the book, because Star Trek is no longer the dominant force in science fiction television. Since I wrote the book, we've had a decade of X-Files, and Buffy the Vampire Slayer, plus Firefly, Stargate, a new Battlestar Galactica, Farscape, and Lost to consider. But for much of Space:1999's twenty something years, it had to deal with Star Trek as competition, and so that factored in to much I wrote about the series. Anyway, Exploring Space:1999 features an interview with Catherine Schell (the actress who played Maya in the second season), it republishes (with permission) the New York Times review of the series by Isaac Asimov, and boasts a detailed episode guide. "...a must for series fans..."-VIDEOSCOPE"
"Muir's book is a pretty good history of SPACE:1999, and it includes a painstakingly detailed episode guide. "-FRANKLIN HARRIS, PULP CULTURE, Jan 07, 1999. "...a very well-made account...a thoroughly researched look into Gerry Anderson's...space epic...the author is honest and open about the show's flaws...and he goes a long way towards debunking some of the absurd criticism thrown at the series..." - POPACALYPSE: The TV Bookshelf. "Invaluable information is provided on the series... [some of which] never revealed before. A must for any fan of the series." - LE SITE QUEBECOIS DE COSMOS:1999. Space:1999 occupies a unique and not altogether happy position in the Valhalla of televised space adventures. It is the program that [some] Star Trek fans love to hate, even 20 years after its debut. When it is not being ridiculed or attacked, 1999 is often forgotten or overlooked by science-fiction historians and television critics, probably because it was a British-made product that never aired on the major American television networks. Perhaps Space:1999's biggest problem is simply that it appeared at the wrong time. It stands sandwiched between Star Trek (1966-1969) and Star Wars (1977), two milestones of the genre. Star Trek is noteworthy because it was the first serious space program [in America] to feature continuing characters, and Star Wars, of course, opened up a whole new realm of amazing special effects and make-ups. But between those great accomplishments stands a seldom-seen, spectacular exploration of the unknown that deserves far more attention than it has received. Space:1999 premiered in September of 1975 and featured the ongoing outer space adventures of Commander John Koenig, Dr. Helena Russell, Professor Victor Bergman, and the 311 astronauts and scientists stationed on Moonbase Alpha. What made the series unique was that these intrepid heroes journeyed through space not aboard a warp-driven starship, but on the moon. On September 13, 1999, a surge of magnetic energy caused the nuclear waste dumps on the far side of the moon to explode. The result was like a giant nuclear engine, pushing the moon out of Earth's orbit and into a space warp which ultimately deposited the moon light-years across the galaxy. Even though it is locked between two juggernauts of sci-fi, Space:1999 pioneered many of the groundbreaking visual effects that would later make such dramatic impact in Star Wars. Perhaps more significantly, many major 1999 character and story concepts would be repeated in the successful Star Trek productions of the '80s and '90,s particularly The Next Generation. There is, however, much more to appreciate in Space:1999 than its historical position. It featured one crucial element that [contemporaries] Logan's Run (1977), The Fantastic Journey (1977)...and Buck Rogers in the 25th Century (1979-1981) all lacked: a brilliant and consistent vision of the universe. Indeed, the first 24 episodes of Space:1999 featured a richly-visualized world where space was a terrifying, confusing and spectacular mystery. Each story explored the unknown and portrayed the Alphan space voyage as a journey into wonder, awe, and horror. Unlike the futuristic superheroes of Star Trek, the travelers on Moonbase Alpha were recognizably human and contemporary. They were unprepared both technologically and psychologically for a long voyage into deep space, and as a result, their emotions, fears and attitudes often caused more harm than the aliens or space phenomena they encountered. ...So if you are a longtime Space:1999 fan, rediscover the mystery and excitement of Gerry and Sylvia Anderson's 'supreme space adventure' in these pages. If you are new to Space:1999 or a science fiction fan who has disregarded it because of popular reputation, read on and experience a world very different from Star Trek. It is a world where humans often make mistakes, where mysteries are intentionally left unanswered, and where the laws of physics defined by scientists no longer apply..."
Exploring Space:1999 is available at Amazon.com. Jump into a world beyond belief and order the book, if you can.